This past Saturday, Dad had an idea. It was going to be sports day Saturday. Now, this wasn’t really a grand idea. Just a way to try and get the kids to try a couple of new things sports related instead of the usual toys they were using when they went outside. Oh, and yes, part of the idea was to try and get them outside as well. Not that the kids don’t like to get outside, but actually Mom and Dad can sometimes stay cooped up too much. Mom went for a run with friends, so Dad decided to take Campbell and Mara to a local elementary school field. Sometimes when we just stay around the house there are too many distractions with other toys and things to get them to concentrate for a bit of time on one thing. We started with lacrosse. Unfortunately the attempt at lacrosse was a little disappointing as the kids thought it was too hot out and that killed any sense of concentration of putting a ball in the stick. We will have to try that one again sometime soon when it is a little cooler out. But then once we put the sticks down, the heat didn’t stop Mara from challenging Campbell to a race to the soccer goal. So all was not lost on the trip to the field. We did some racing around. Then we went back to the house. Dad made a rule. They could do anything they wanted as long as it involved a ball. Eventually this led to playing some basketball. 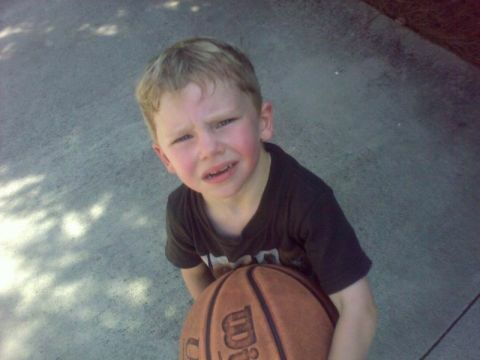 This ball is bigger than me! Although it didn’t end up as good for lacrosse practicing as Dad would have liked, it did end up being a good sports day. The kids had a lot of fun with basketball, and they especially liked topping it off with some dunks on the basket and hanging on the rim. Fun! 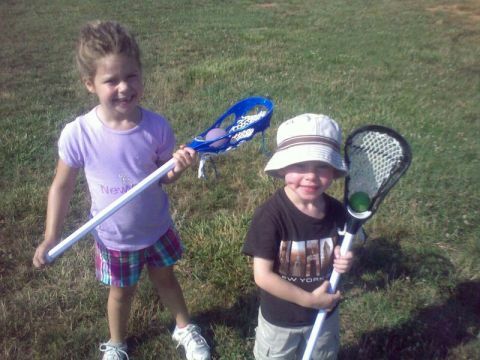 Hey Campbell and Mara, when you play lacrosse you can tell people all about this oldest game played in North America. Many of the American Indian tribes played lacrosse. Have fun, and keep all those balls moving. Auntie Monie and Uncle George like this post.